An introduction into the fundamentals of FellowshipOne. From logging into the portal to using our FellowshipOne Mobile app. This 1.5 hour course is what you need to learn the basics of FellowshipOne. Great course for new staff and/or key volunteers! The People Management module covers the details of managing data in your system with a focus on people data. The People Interaction module covers the details of interacting with attendees and members of your congregation through Notes, Contacts, Attributes and Requirements. The Activity Management module covers how to manage activities and events in FellowshipOne. Learn how to create and manage your FellowshipOne Event Registration forms. Learn how to use Volunteer Pipeline to manage applications and opportunities for volunteers to serve. Champion Certification: Event Registration Learn how to create and manage your FellowshipOne Event Registration forms. 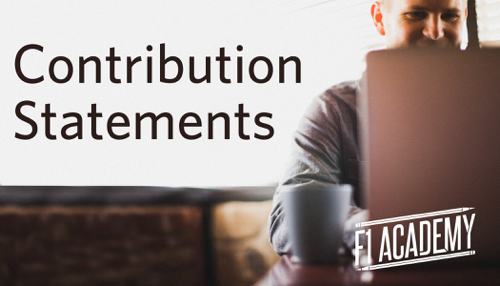 Learn how to generate online and paper contribution statements.